Ginger usually comes from Jamaica and its name means “horn root” translated from the Sanskrit. Though it smells very spicy, the flavor is a combination of sweet and peppery. Recently, this root has edged its way into more mainstream cooking, but originally it was most frequently found in Asian and Indian cuisine. Fresh ginger is a great addition to stir-fries, as it adds an interesting spice. Young ginger has a pale skin and this is the mildest form. The more mature kind has a rougher surface, which needs to be peeled before using. Ginger can be easily peeled with a vegetable peeler. Avoid old ginger, which gets stringy, making it difficult to peel.This is the more common choice. 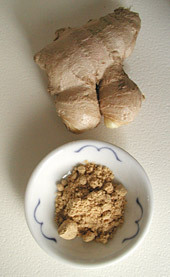 Ground ginger is most commonly used in European and American cooking in baked goods – more and more, however, even mainstream cookbooks call for the freshly grated version. Ground ginger (think gingerbread) is much different in flavor than the fresh kind, and the two should not be substituted in most baked goods. Although lacking the characteristic zip of the fresh form, ground ginger does make an excellent addition to soups and curries, as well as the occasional compote. Crystallized ginger tastes just like candy in fact, it has been cooked in a form of sugar syrup and coated with granulated sugar. This form of the root is usually used as decoration or in desserts. Pickled ginger is the familiar condiment served alongside sushi and can be purchased at gourmet stores and Asian markets. This entry was posted on Saturday, November 3rd, 2007 at 6:18 am	and is filed under Encylopedia, Herbs & Spices. You can follow any responses to this entry through the RSS 2.0 feed. You can leave a response, or trackback from your own site.